publication samedi 28 septembre 2013. Click on button OK then choose a name for the html page and save it to the desired directory. You will the get a html file that can be set online, containig the MathGraph32 figure. Launch the execution of a macro. Modify a calculation in a formula editor directly on the figure. Modify a variable value by clicking on the + or - buttons associated to the variable. You can export only a part of the figure (always starting from the to left corner). For this use icon . Then you can either enter dimensions of your choice either validate by OK and use the capture tool to modify the dimensions on this selection rectangle. Only he inside of this rectangle will be exported. These lines create a SVG with dimensions 550 on 400 pixels that will contain the figure. This SVG must be contained in a DIV section. will be called when the library MathJax will be loaded and ready to load the figures et display them. defines a figure and adds it to the figures managed by the application mtg32App. The first parameter is the ID of the SVG that will contain the figure. The second parameter is a string that entirely describes the figure and may be very long for a compex figure. 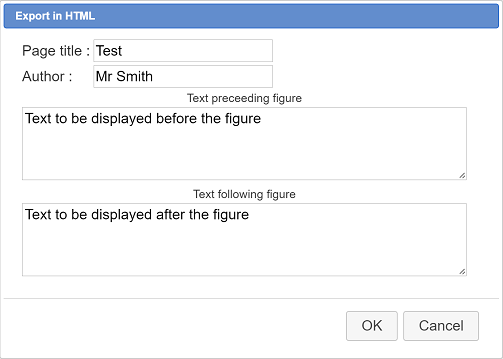 The third paraeter is true if the figure must be displayed as soon as the page is loaded and false otherwise (for example if the figure is in a hidden DIV). configure the external MathJax library used by MathGraph32 to display the LaTeX formulas. prepare MathJax then launch function mtg32Start that will load and display the figures. For instance we want to display under our first figure another one that is opened in MathGraph32. We must therefore add another DIV in the Body that will contain a second SVG for the display of the new figure. In order to know the width et height dimensions of the SVG, you may use menu Help - html code for Applet, for instance here 600 pixels width and 450 pixels height. Thats’it and your html page now contains two MathGraph32 dynamic figures. This function recomputes the figure assiated with the SVG of ID idDoc. If brandom is true, the random calculations are updated sont réactualisés. If brandom is false, the random calculations are not updated and return the value previously calculated. This function recomputes the figures managed by the application. Si brandom vaut true, les calculs aléatoires sont réactualisés. If brandom is false, the random calculations are not updated et give the value previously calculated. Entirely redisplays the figure contained in the SVG of ID idDoc. This function gives to the calculation or function named name the formula contained in parameter formula (string). This affectation is done in the figure associated with DIV of ID idDoc. In the preceeding example, if the first figure contains a calculation named a, the code mtg32App.giveFormula2("mtg32svg", "a", "pi + 1") will give to the calculation named a of the first figure value pi + 1. Executes the macro with name nameMacro in the figure associated with the SVG with ID idDoc. The first parameter is the ID of the SVG associated with the figure to be modified. If the parameter ba is false, the figure will nolonger respond to actions applied on it aux actions qu’on fait sur elle (for instance moveable points will no longer be captured .if theparameter ist true the figure will react again to actions applied on it. The first parameter is the ID of the SVG associated with the figure to be interrogated. The second parameter is the name of the calculation or variable the value is to be asked for. This function returns the current value of the calculation or the variable. This function may be asked when the figure contains editors for formulas. The value returned is true if all the editors contain a valid formula or are empty. This function returns true if the first editor field associated with the calculation named name contains a valid formula. It returns false if the editor is empty or contains an invalid formula. The first parameter is the ID of the SVG associated with the figure we want to act on. This function empties all the field editors of the figure. This function gives the keybord focus to the first formula editor that contain an invalid formula or is empty. The first parameter is the ID of the SVG associated with the figure wewant to act on. This function gives the keybord focus to the first formula editor associated with calculation or function named name. When a html page containing MathGraph32 figures has been created, it is possible to get the long string (Base 64 string) describing the figure : this string is the parameter given to function addDoc. All you have to do is paste it in the clipboard. Then use icon and click on Figure through Base 64 code. A dialog box pops up. Just paste the base 64 code you got from the html page and validate. Then you will see the figure appear and will be able to modify it. 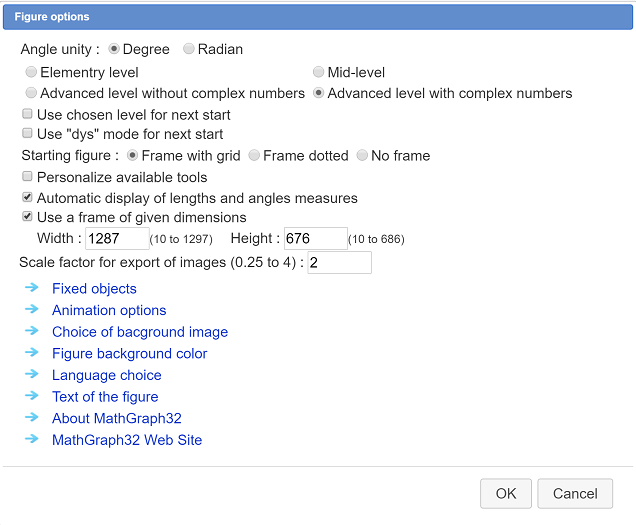 Then you have to start MathGraph32 and use menu item File- New figure bycode. A dialog box pops up. Just paste the string in the editor field and a new MathGraph32 figure will appear and you will be able to modify it inside MathGraph32 software.